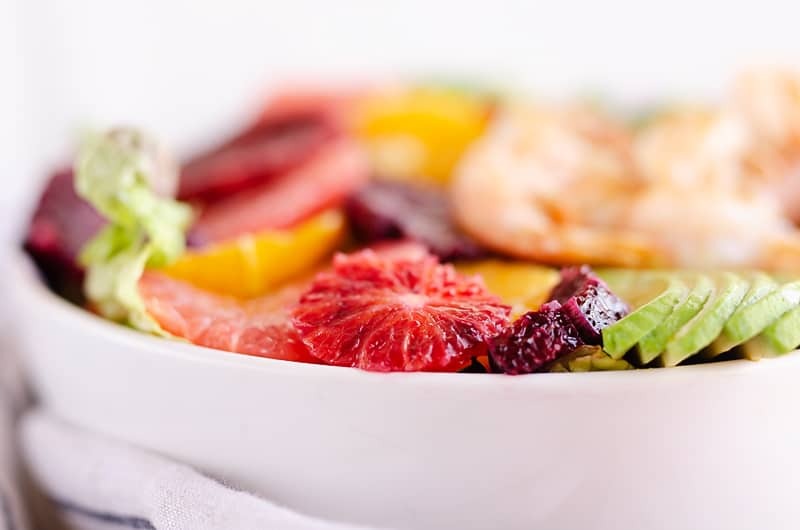 I adore fruit in my salads, but during the winter my go-to Strawberry Salad isn’t a great option with the fruit lacking flavor this time of year. 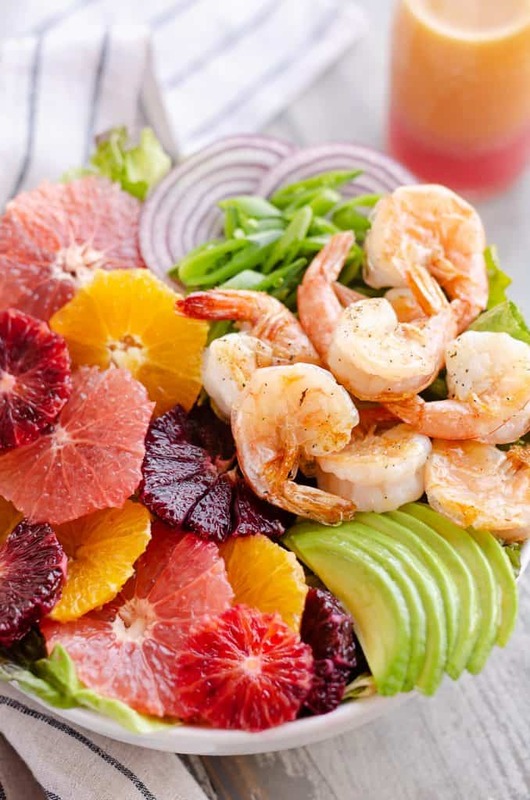 I decided to use the fruit that was at it’s best in it’s prime season and piled on a variety of citrus fruits on this healthy Citrus Shrimp Salad recipe. 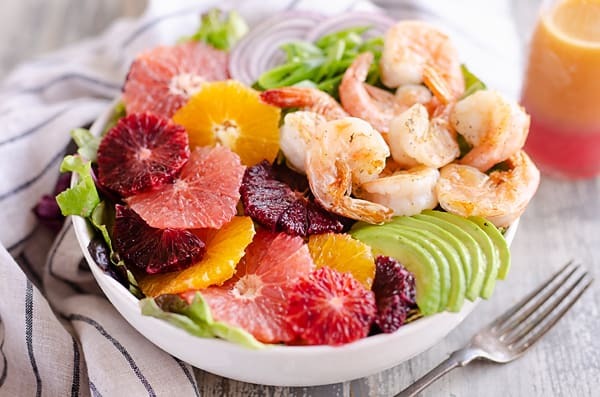 Oranges, grapefruit and blood oranges along with crunchy vegetables and a light citrus vinaigrette make for a perfectly balanced salad that is perfect for dinner or lunch any time of the year! In warmer weather I would toss the shrimp on the grill with some olive oil, salt and pepper for a little more flavor. 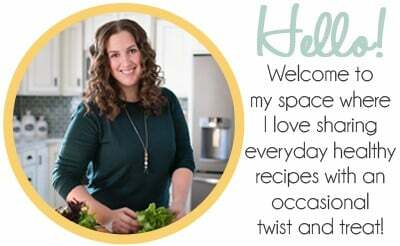 Unlike my brave friend Julie over at Gimme Some Grilling, I don’t venture outside to grill in sub-zero temperatures! Not to mention, I can’t leave my little rugrats in the house unsupervised for more than one minute, because despite my best efforts at baby proofing, they manage to find trouble! Seeing it is still pretty cold in these parts, I sauteed the shrimp up on the stove instead. Speaking of my children, man alive they love fruit and citrus fruit is no exception! I spend a ridiculous amount of money feeding their love of fruit. They would happily demolish a pack of $5 raspberries at one meal between the two of them if I let them. I never imagined it would be so expensive feeding two tiny little humans! At the end of the day at least it is healthier than pre-packaged snacks. I am fortunate enough to be able to buy my family fresh produce, which I am well aware is a privilege, and for that I am thankful! Last time I was at the grocery store they had some blood oranges which I had to add to my cart along with some grapefruits and regular oranges. 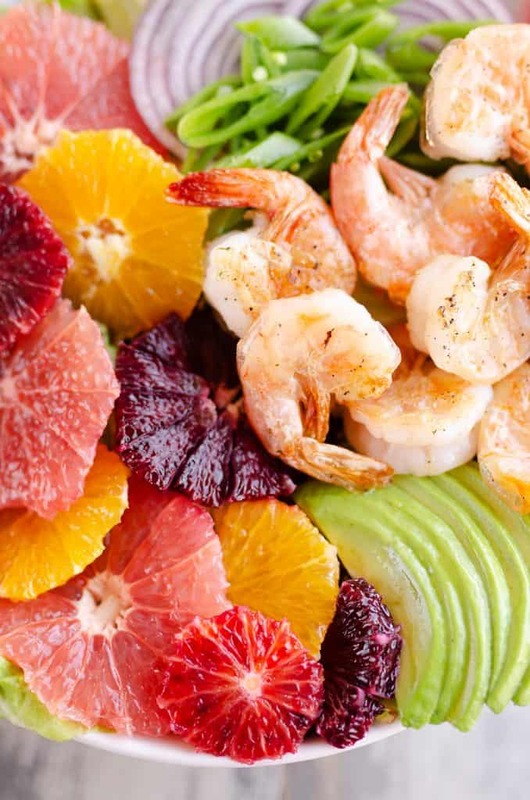 I was instantly inspired to make a healthy recipe featuring the beautiful fruit, which is how this Citrus Shrimp Salad came to fruition. The twins hadn’t eaten grapefruit in a couple of months, back when they were much better eaters, so I wasn’t sure if they would enjoy it. To my surprise they gobbled it right up along with the oranges! They are so hit or miss these days, I never know what they will go for. 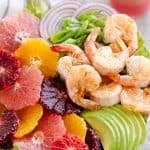 Keeping things light with this Citrus Shrimp Salad recipe, I made a homemade Citrus Vinaigrette using leftover juice from the citrus fruits. You could certainly buy a salad dressing at the store to go on this salad, but nothing compares to making your own. It really is so easy and requires one less thing to buy in most cases. I always have the basics for homemade vinaigrettes on hand, which are olive oil, champagne vinegar and honey. 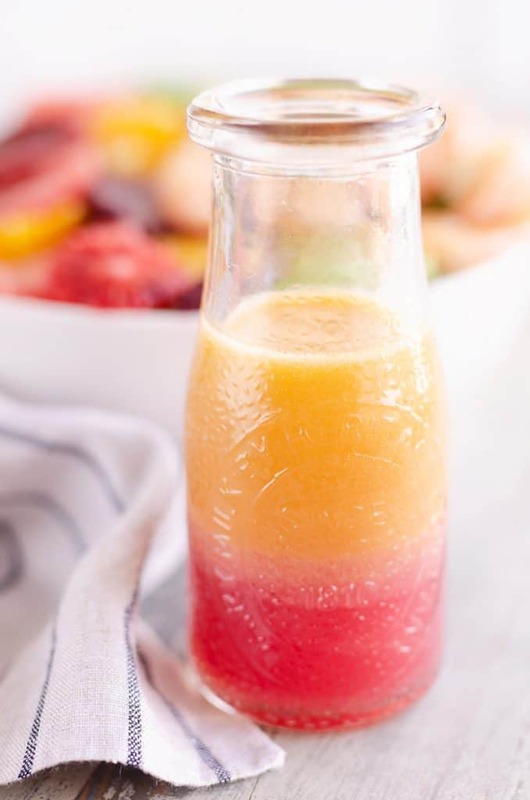 As you can see, the salad dressing will separate seeing it is a very basic vinaigrette without an emulsifier, so just be sure to give it a quick shake before using it. It sure is pretty when it separates though! 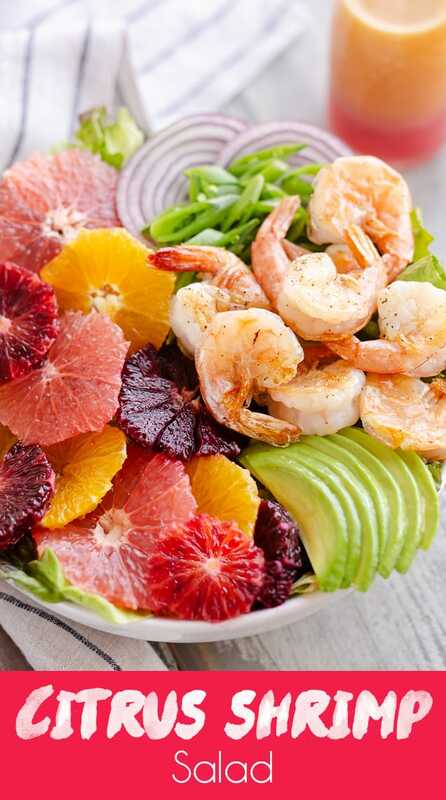 Slice off 1/3 of each of the three citrus fruits and set aside for the salad dressing. Peel and slice the remaining portions and set aside. Juice the three small segments of fruit into a small bowl with a lid. Give the fruit a quick stir and measure out 1/3 cup juice. Discard the remaining juice. To the 1/3 c. citrus juice, add the olive oil, champagne vinegar, honey and a pinch of salt and pepper. Place the lid on the bowl and give it a vigorous shake. Season the shrimp with a pinch of salt and pepper. Heat a drizzle of olive oil in a large skillet over medium-high heat. Add the shrimp to the hot oil and cook the shrimp on each side for 2 minutes, or until they are pink and opaque. 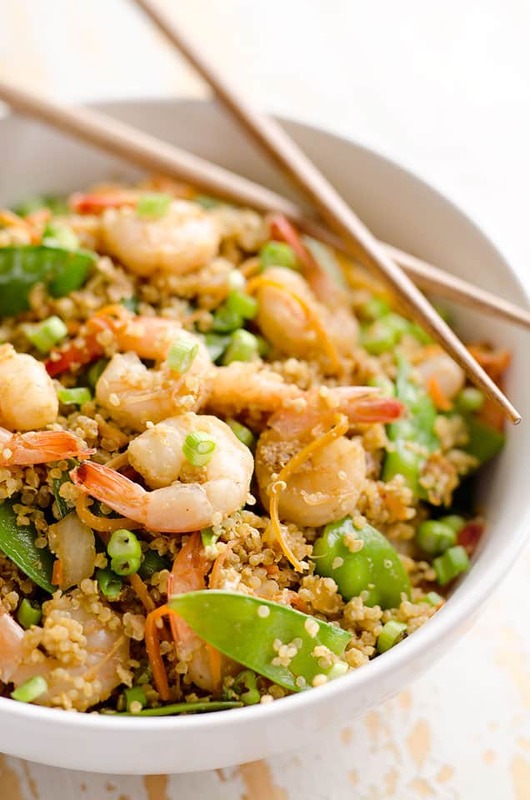 Remove the shrimp from the pan as soon as they are done cooking. 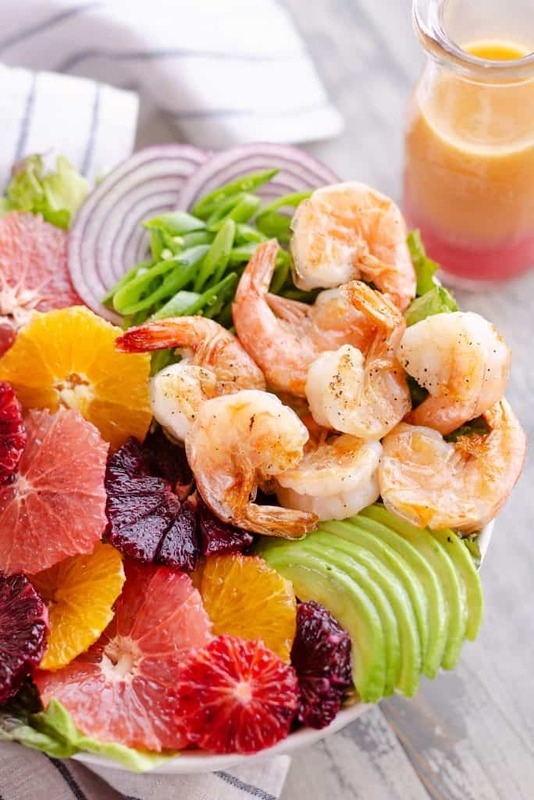 In four medium bowls, divide the mixed greens, sliced avocado, red onion, sugar snap peas, variety of citrus slices and cooked shrimp. 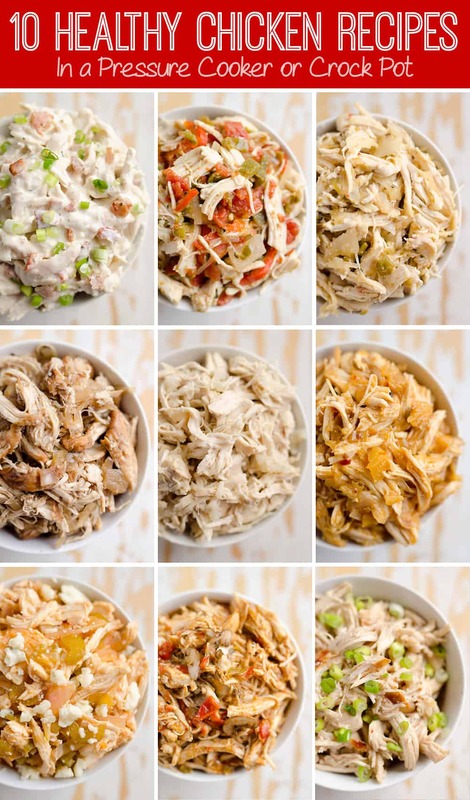 Give the vinaigrette a quick stir and divide among the salads. Serve immediately. How pretty is that dressing?! And it tastes even better than it looks! WOW! I usually think salads are boring but this salad was a flavor explosion! YUMMY! 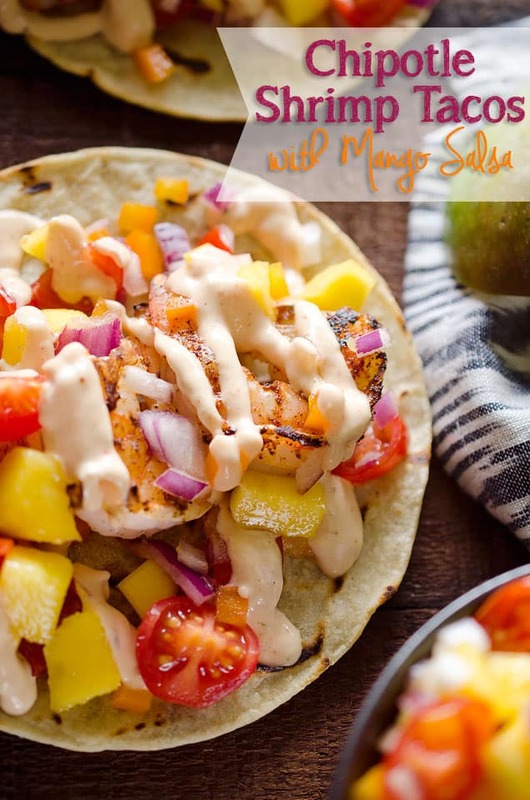 Light, refreshing, and full of flavor!! Such a great recipe, thanks!